Ta' Xindi Farmhouse (Maltese: Ir-Razzett ta' Xindi), also known as the Ta' Xindi Headquarters and Kappara Outpost, is an 18th-century farmhouse built during the Order of St. John in San Ġwann, Malta. It was originally designed to be a farmhouse but went through different adaptive reuse. 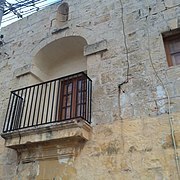 The building served as a farmhouse for two hundred years and is found in the suburb of Kappara. During the French occupation of Malta, the building served as the headquarters for the rise of the Maltese against the French, known as the Gharghar rise and led by the building's owner Vincenzo Borg. A plaque was attached on the façade, during the British period, commemorating Borg's role in the revolt. The building came to national attention when it was mentioned in the Maltese Parliament by Prime Minister Lawrence Gonzi, then followed by its schelduling by the Malta Environment and Planning Authority. Today the building is a national cultural monument. The building is a private property and following its refurbishmnet it is used as a residential home. 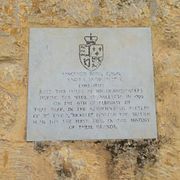 The Ta' Xindi Farmhouse was built by unknown Maltese farmers sometimes during the Order of St. John in Malta. It is structurally modest in design and built to cater as any farm of the time, according to local costumes. It is built in the suburb of an area called Kappara in San Ġwann. The building remains until day overlooking farmlands and is at the middle of a hill. A common building which the building overlooks today is the Mater Dei Hospital in Birkirkara. When the building was built the area was under the municipality of Birkirkara but today is under the San Ġwann Local Council. At the end of the Order of St. John the building belonged to Vincenzo Borg who was famously known by his nickname as Brared. In 1798 Malta was invaded by the French led by Napoleon Bonaparte who were on their way to conquer Egypt. Over 4,000 men were left behind the Napoleon when he left in order to keep control if the Maltese archipelago. Initially the Maltese had supported the French but having not received what they were expected, growing in disappointment and propagated by landlords and the Catholic Church, the Maltese have rose against the French in different batallians around Malta. 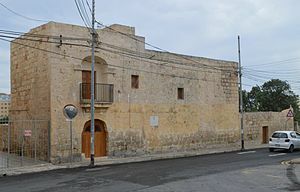 In such context the Ta' Xindi Farmhouse became also known since then as the San Ġwann Headquarters when Vincenzo Borg took the lead for the rise against the French, famously known as the Gharghar rise. Vincenzo Labini, the back then bishop of Malta was well informed about the insurgence of the Maltese. Alexander Ball initially did not trust Vincenzo Borg in the belief that Borg was after power over the Maltese. During the conflict the farmhouse, now outpost, was secretly used as headquarters while the French soldiers kept control of the fortifications of Malta. The building manned more than 550 native Maltese soldiers of mixed capacities. The soldiers safeguarded and over the surrounding areas and generally attacked at once with other outposts such as Birkirkara and Mosta. On 2 September the Maltese resurgence has managed to acquire two 18-pound cannons that were stored and at times used at the farmhouse. The flag of Great Britain was raised for the very first time in Malta in 1799 by Vincenzo Borg himself of which a plaque was inaugurated on the façade of the farmhouse that includes this historic event. During the insurgence the farmhouse was used as an emergency hospital. Despite small the building had to cater as a hospital for a large number of families which included people who took refuge in the countryside from the fortified cities that were occupied by the French. In 1833 Borg was awarded the Order of St. Michael and St. George by the British. John Hookham Frere had such a good friendship, and appreciation, for Vincenzo Borg's role against the French that when Borg died Frere has inscribed by documenting this on Borg's grave at the St Helen's Basilica in Birkirkara. The farmhouse came to public attention to be preserved after some sections of it were being demolished during refurbishment. Back then Prime Minister in Office Lawrence Gonzi has made reference to the farmhouse and its rich history. Since then measures of preservation have taken place. The building remains to be a private residence and not a museum. It is currently being used by its owners as a family home. A plaque is found on the façade of the building, commemorating the Gharghar rise against the French and Vincenzo Borg's heroic role at the same time. Vincenzo Borg C. M. G.
During The Siege of Valletta in 1799. 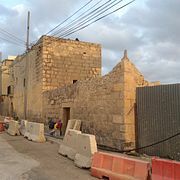 The Ta' Xindi Farmhouse is scheduled by the Malta Environment and Planning Authority (MEPA) as grade 1 national monument. It is also listed on the National Inventory of the Cultural Property of the Maltese Islands. Cutajar, Tony C. (2002). Il-Misteru tar-Razzett Ta' Xindi. Book Distributors Limited. ISBN 99909-93-95-5. ^ a b c d e "Town Twinning". Sangwannmalta.org. Retrieved 16 January 2018. ^ a b c d e f "National Inventory : Property Name Ta' Xindi Farmhouse" (PDF). Culturalheritage.gov.mt. Retrieved 16 January 2018. ^ a b c "Town Twinning". Sangwannmalta.org. Retrieved 16 January 2018. ^ "Local Councils - San Ġwann - History of the Locality". Lc.gov.mt. Retrieved 16 January 2018. ^ Mr. Christopher Simpson. "Maltassist - Town and Villages Page - Hotel, self catering and host family accommodation in Malta - Car hire, English language courses, yacht charter and tours". Maltassist.com. Retrieved 16 January 2018. ^ Desmond Gregory (1996), "Malta, Britain, and the European Powers, 1793-1815", Associated University Presses, Political Science, p. 167-8. ^ Malcolm Archibald (2014), "Tarver's Treasure", Black and White Publishing. p. 53. ISBN 9781845027827. ^ By Barry Hough, Howard Davis, Lydia Davis (2010), "Coleridge's Laws: A Study of Coleridge in Malta", Open Books Publishers, ISBN 9781906924126, p. 122. ^ Savona-Ventura, Charles (2015), "Knight Hospitaller Medicine in Malta (1530-1798)", Lulu.com, ISBN 132648222X, 9781326482220, p. 301, 302. ^ "125 properties on National Inventory of the Cultural Property". The Malta Independent. Retrieved 16 January 2018. ^ Allied Newspapers Ltd. "Parts of historic building demolished". Times of Malta. ^ "List of publications - Tony C Cutajar". Cutajar.net. ^ "MALTA - DIBATTITI TAL-KAMRA TAD-DEPUTATI", (Rapport Uffiċjali u Rivedut), IL-ĦDAX-IL PARLAMENT, Seduta Nru. 366, L-Erbgħa, 15 ta’ Ġunju, 2011, Stampat fl-Uffiċċju tal-Iskrivan, Kamra tad-Deputati, MALTA.